Daniel Patterson was born and raised the small community of Tokoroa who are a small community with a BIG heart. Daniel says its a community that cares but lacks direction. So he decided to try and instil the values of yester-year by inviting the community to roll up their sleeves and get stuck in to become the change they all want to see. He says, what started out as a community focused project to beautify our home with an environmental focus has since evolved into something so much bigger. His first project instigated a major clean up of the visible train tracks that pass through the middle of town. With such a high participation rate from the public and such positive feedback, this project quickly evolved into "what else they can do here." Daniel says the idea to create a living Bee corridor on the under utilised land either side of the train tracks came to me like I light switch being turned on. "Knowing the problems and endangerment that our pollinators are currently facing and how reliant we are on them as a species I was incredibly excited to run with this idea." The Mayor is 100% behind the move, as is kiwi rail who are offering support and financing to make this dream a reality. 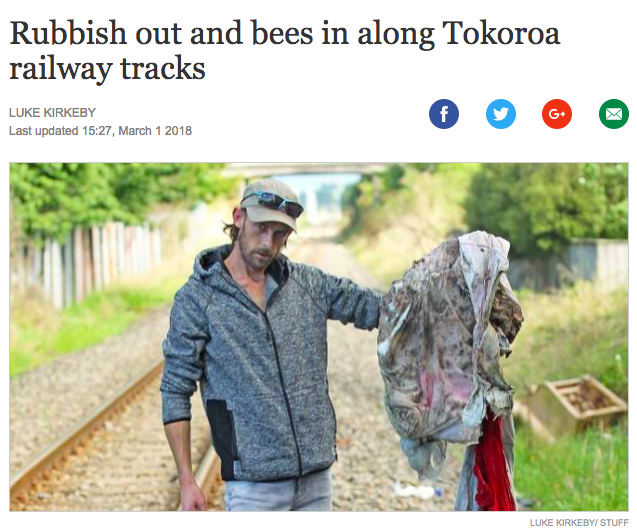 "So incrementally we are cleaning, clearing and sowing the vacant kiwi rail land the length of Tokoroa, with a long term goal of implementing the scheme the length of the South Waikato and beyond. They are also interested in incorporating other under utilised council land." Daniel is thrilled to be taking a leading role in the project as this has quickly become his passion and focus. Leading a team of volunteers he is extremely excited to watch this become a reality and see the long term benefits begin to take effect in their region. Their dream is to explore all the ways they can incorporate and involve further community groups and schools in an ongoing education program.